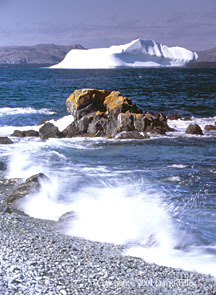 Photography of Wildlife & Natural Areas of Newfoundland, Iceberg alley. Sun & the hammering of sea swells wear away at the rugged icebergs. The sculpted rocks and sorted cobblestones are also products of the seas persistance.